A web designer named Ji Lee, from New York, put together a video recently. One that has been viewed more than four million times on Facebook. The video in question is about Ji’s dad, Chan Jae Lee, and the drawings he makes for his grandkids. Ever since his grandkids moved away, Chan Jae became increasingly sad, withdrawn and only interested in watching TV. He lives in Brazil; Ji lives in New York and his sister and her two sons, Jae’s grandsons, live in Korea. Ji came up with an idea to stimulate his dad and nudge him do something sweet for the little ones. He recalled that his dad used to be really, really good at drawing. 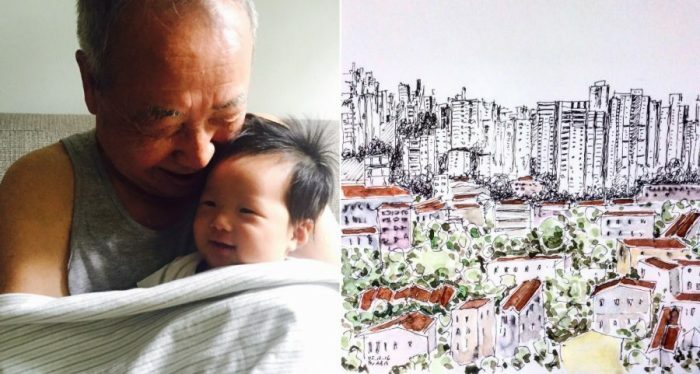 So, why not put pencil to paper and maybe just dedicate the drawings to the grandkids? Ji’s mom was already a pretty experienced social media user, so he asked her to help Chan Jae to upload the doodles online for all three of his grandsons to see. So, the Instagram account Drawings for My Grandchildren was born. At first Chan Jae, 75, resisted. Eventually, he gave in – the last push a visit to New York to see his third grandson. The connection he felt was growing ever stronger and the idea that – he may not be around to see him grow up made him realise that he all he wanted to do was leave something beautiful behind. He wanted to connect with his family, more than ever before.